Image caption A coroner recorded a narrative verdict and said "at some point [Jessica's] neck became entangled"
An 18-month-old girl suffocated after getting entangled in a baby monitor cord, an inquest heard. 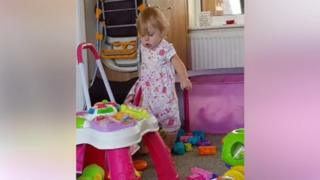 Jessica Duggan's parents left her in her cot for a nap and then went to sleep themselves. When they woke two hours later her mother Danielle found her daughter had the video monitor cord around her neck and she was not breathing. A coroner recorded a narrative verdict and said "at some point [Jessica's] neck became entangled in the cable". Mrs Duggan, from Shipdham, Norfolk, called 999 while her husband Jason tried to resuscitate the child. The ambulance and police service arrived within five minutes of being called on 25 October. Jessica was taken immediately to the Norfolk and Norwich University Hospital and attempts to resuscitate her continued in the ambulance. Her parents described their daughter as a "healthy, happy child" and "an active little girl". The inquest heard the video baby monitor had been placed on a shelf above the cot. Her parents said they thought they were doing "the right thing" by using the monitor and had tried to keep the power cable and cord as tight to the wall as possible. A police statement read out at the inquest in Norwich said "the cables from the monitor were accessible through the bars of the cot". It added there "was nothing to suggest that this is anything other than a tragic accident". Norfolk coroner Yvonne Blake said "at some point her neck became entangled in the cable." Jessica died from compression of the neck from ligature or suffocation, the inquest heard. After the hearing, Mrs Duggan said parents needed to take extra care to ensure children were safe. "As far as we were aware, she should have been safe," she added. "We don't know how she managed to get the cable."